The Surgi-Snuggly is a multi purpose garment constructed of soft, incredibly stretchy material allowing for comfort and fit. Your pets can go about their daily routines in the Surgi-Snuggly including eating, sleeping, going to potty and of course snuggling. The Surgi Snuggly is a one of a kind suit perfect for a variety of pet ailments including. 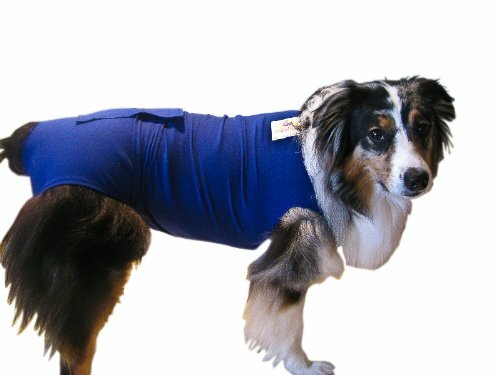 Post surgical garment for after surgery comfort (No more cone of shame) Ease fear during thunder storms ( boat/car rides, kennel boarding ) Inhibits itching and scratching ( hotspots ) Aids in shedding hair containment. Use with pads for dogs in heat Incontinence Get your Surgi Snuggly today and you too will see why so many veterinarians and university vet schools use the Surgi Snuggly. 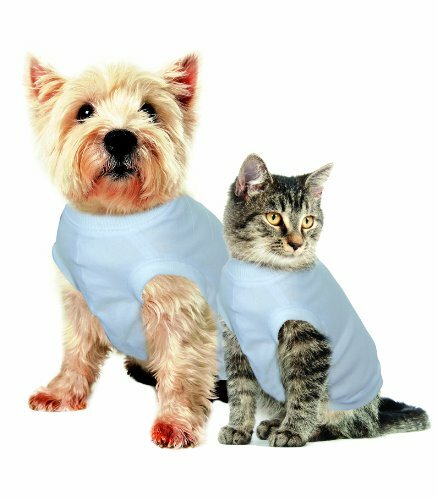 Developed specifically for dogs, can be used on cats too Wear as a full or half suit. A simple solution to protecting surgical wounds. Purrfectly Comfy After-Surgery Pet Clothes are worn like a hospital gown covering stomach wounds and helping to keep cuts and stitching clean. Snaps along the back of the gown help pet owners easily dress their cats or small dogs while optional-use leg straps and a variety of sizes help provide a secure fit putting an end to the stress of E-collars or cones. Garment Size: Extra Small fits most kittens and tiny puppies as well as most smaller adult toy breed dogs and small adult cats. Neck: 20 CM, Back Length: 31 CM, Chest: 30 CM. The Surgi-Snuggly is a multi purpose garment constructed of soft, incredibly stretchy material allowing for comfort and fit. Your pets can go about their daily routines in the Surgi-Snuggly including eating, sleeping, going to potty and of course snuggling. The Surgi Snuggly is a one of a kind suit perfect for a variety of pet ailments including. 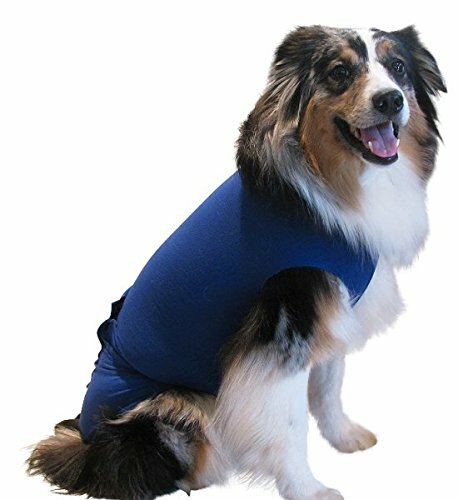 Post surgical garment for after surgery comfort (No more cone of shame) Ease fear during thunder storms ( boat/car rides, kennel boarding ) Inhibits itching and scratching ( hotspots ) Aids in shedding hair containment. Use with pads for dogs in heat Incontinence Get your Surgi Snuggly today and you too will see why so many veterinarians and university vet schools use the Surgi Snuggly. Developed specifically for dogs, can be used on cats too Wear as a full or 1/2 suit.